Source: Confederate Soldiers Memorial, Enfield. Image courtesy of the North Carolina Department of Cultural Resources. Photo by Tom Vincent. The monument, which stands approximately ten feet high in the center, is Georgia marble with bronze tablets. Two small walls extend bilaterally from the center, square column, and one side supports a drinking fountain. 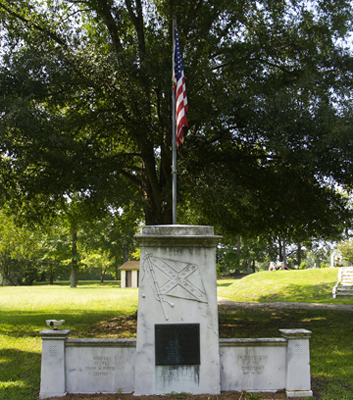 A Confederate flag is carved into the marble one one side of the center column. A 48-star American flag is carved into the other side, along with the symbol of the American Foreign Legion. Below each flag, a bronze plaque is affixed to the structure. The small walls to either side are carved with inscriptions. The small columns at either side of the short walls are carved with rosettes. Center column, under the Confederate flag, inscribed upon a bronze plaque: 1861 (laurel wreath with flag and bow) 1865 / TO THE MEMORY OF THE VETERANS / OF THE WAR / BETWEEN THE STATES / "WE CARE NOT WHENCE THEY CAME / DEAR IN THEIR LIFELESS CLAY / WHETHER UNKNOWN OR KNOWN TO FAME / THEIR CAUSE AND COUNTRY STILL THE SAME / THEY DIED AND WORE THE GRAY"
Exercises began at 4:30 pm. D. Mac Johnson presided over the community-wide Memorial Day celebration. O. P. Dickinson, a prominent Wilson attorney, delivered the address. His speech praised both the Confederate veterans and the soldiers of the World War. Billie Harrison and Mary Parker, both descendants of Confederate veterans, unveiled the fountain. Mayor A. W. Andleton accepted the memorial on behalf of Enfield. The Joyce Kilmer stanza is excerpted from a larger poem entitled Rouge Bouquet (1918), and it was first published two weeks after his death in 1918. The unattributed verse under the Confederate flag is from "The March of the Deathless Dead" by Abram Joseph Ryan, a Catholic priest who served with the Confederate Army. Francis M. Parker was a colonel of the 30th North Carolina Infantry Regiment during the Civil War. The chapter bearing his name was chartered in 1907 and is now defunct. During segregation, the fountain provided two drinking spouts, one for whites and one for non-whites. The fountain for non-whites has been removed, but its pedestal and spigot hole remain. Both Sue Curtis and the North Carolina Department of Cultural Resources list the dedication date as June 3, 1928. The fountain was originally located on a street in downtown Enfield. The monument stands in a grassy field in Randolph Park, near a small stream. It is visible from McFarland Road and from a small access road that divides the park from Elmwood Cemetery. Inscriptions have continued to be added to the monument, commemorating World War II, the Korean Conflict, the Vietnam War, and the Persian Gulf War.